Hey. 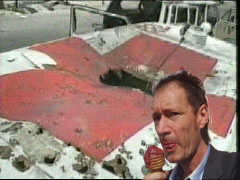 That photo of the bomb hole on the Red Cross truck is real. I know. I was walking past it the other day while enjoying a leisurely stroll down the streets of Beirut, licking an icecream, as this unedited absolutely genuine untouched photo will prove beyond a doubt. Sounds like RatherGate all over again. Heres the skinny: Bloggers figured out that some Lebanon war images had been edited on photoshop and blew the whistle. Newsbusters has the image in question. HT: Moriel Ministries email which gives a little twist from the Scriptures: Mark 4:22 “For nothing is hidden, except to be revealed; nor has anything been secret, but that it would come to light. Previous Post (p)	Is the Emerging Church Movement "Orthodox" and Should We Charge Money?